Forbes posted and article written by Ric Dragon, an expert on online marketing, about the best ways that a business can use its social media. Here is our summarized version of the article. Make sure that all team members that administer your social media use the same voice. Customers these days want a “humanized” voice. Ex: NPR has a twitter account called “today in 1960″ that tweets headlines from the corresponding day in 1960. How unique is that?! Dont make your tweets, Facebook posts or what have you so general. Try to create a community that will engage with you and feels a connection with your company. Here’s an example, Lady Gaga refers to her fans on twitter as “Little Monsters” and she is “Mother Monster.”Of course we do not suggest you calling your customers this, but you get the idea. This aligns a lot with number 3. The best communities become your best advocates. Create a plan that aligns with your goals. The most common/useful plans include a listening plan, channel plan, SEO plan etc. Also make sure that you are using social media to build relationships and to start conversations. You cannot expect to get the results you want immediately. So you have to make sure to tweak and adjust your plans according to the results you get. And its not something you do once. This entry was posted in Marketing, Tips & Tricks, Uncategorized on September 13, 2013 by Bloomington Chamber Staff. I came across this blog while conducting some bench marking for a marketing project I’d undertaken. Blog author, Phil Buckley, was able to succinctly drill down to the main point behind my project: Chamber membership makes GREAT sense and should be viewed, at least in part, as (very) SMART advertising/marketing. Brilliant! When you run a brick and mortar business one of the places you would like to be listed at is your local Chamber of Commerce. The links that come from your Chamber of Commerce site offer two real values. First is a local citation that is a trusted organization that is over 100 years old. Second is a link that has the potential to bring both customers and better rankings. I’ve looked at about 10 chamber of commerce pages and noticed some strengths and some areas that could be improved. Raleigh, North Carolina has a very typical Chamber page. It has a few featured members, some news and a way to search their membership for companies. What I want to focus on is what a company can get from a Chamber of Commerce membership that impacts their rankings in the search engine results. As with almost any website, the Raleigh Chamber’s homepage offers the biggest bang for your link building buck. There are only 21 outbound links on their homepage. According to Open Site Explorer, the homepage has high page authority (73/100) and domain authority (67/100). Those are exactly the type of pages you want to get back links from. The fact that they are not properly canonicalized makes the link even better than it first appears. The page metrics are almost as strong for the domain without the www. A link from the homepage of Raleigh’s Chamber of Commerce website is going to pass 4.6 MozRank to your website. That’s extraordinary. There are very few opportunities to get such a powerful link that is viewed by Google as natural. 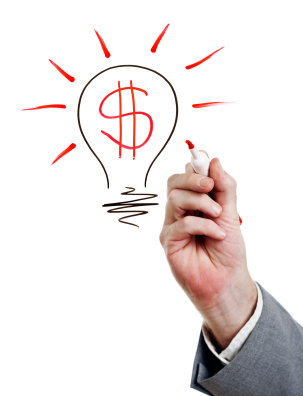 Those companies who have their businesses highlighted in the right rail have made a smart investment. 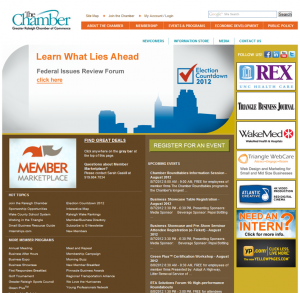 But what if you don’t have the budget to put an ad on your Chamber of Commerce homepage? There may be additional opportunities that are slightly deeper in the site, but still a step up from your basic listing. Many visitors will make their way to the member directory to see if a business is listed or to search for a business in a specific niche. As you can see from the screenshot on the right, there is not a single member taking advantage of the second best opportunity on the site. The member directory has only 3 outbound external links. The MozRank passed from this page is 3.39 That doesn’t mean that a link from that page is 75% as good as the homepage (because it’s a logarithmic scale) but it’s still an excellent backlink.. I would imagine that the opportunity to get your company listed on this page would cost significantly less than the homepage, and the link love is immediate for your website. 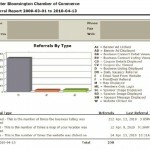 If all you’re doing is filling in the details of your business on Chamber’s website, you’re missing out. By the time you drill down to that level, those pages are not sending any MozRank for the link you have included. Like most everything else in life, the standard version isn’t giving you the best bang for your buck. 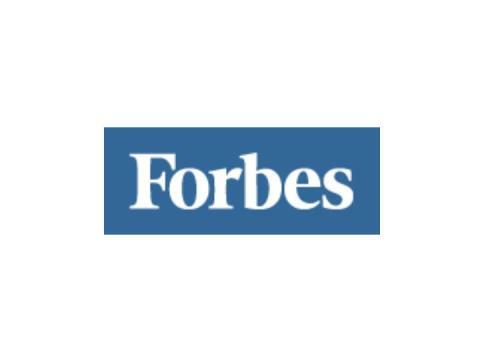 You need to step up your game if you want to outrank your competitors. Joining your local Chamber of Commerce is a smart move. Joining and then taking advantage of the additional exposure, traffic, branding and backlink juice from the front page is even smarter. Make sure you have areas available for “featured members” to upgrade to. Think of the Chamber as an advertising opportunity. Don’t just send in boilerplate and wait for magic to happen. This entry was posted in Marketing, Membership, Tips & Tricks, Uncategorized and tagged Advertising, Marketing, search engine optimization, SEO, small business on December 7, 2012 by Bloomington Chamber Staff. Just yesterday, I was emailing a brand new Chamber member of only a few of weeks. 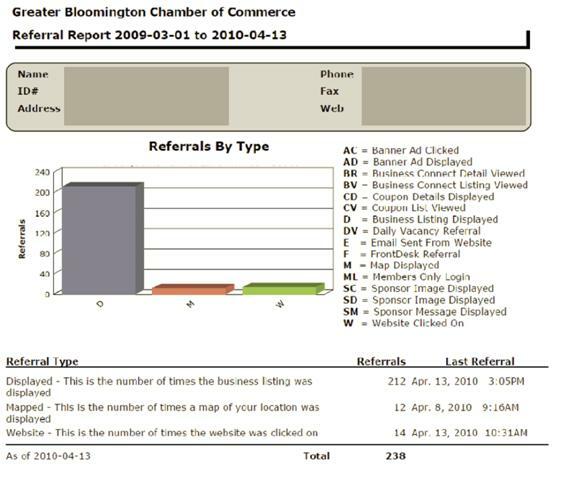 I decided to attached their referral report – a handy-dandy report that details how many times their business information was viewed on The Chamber’s on-line directory, how many times their website link was clicked, and how many times people mapped their business location. As a marketing person, I was really excited by what I saw in their referral report! This brand new Chamber member’s listing had already been viewed 212 times! Of those views, 14 people actually clicked the link taking them to the business’s website and 12 people mapped how to get to the location! This entry was posted in Marketing, Membership and tagged Advertising, Marketing, Referral, ROI on April 14, 2010 by Kelley Brown.